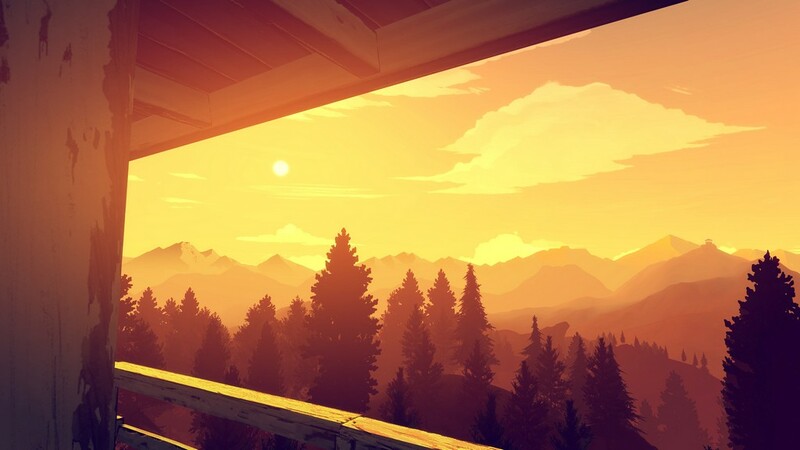 Firewatch begins in 1975. You are Henry and you first meet your future wife, Julia. You learn how they get together, marry, and how the problems start. 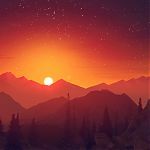 In 1989 the problems take their toll on Henry who eventually has a job land in his lap, taking him to the wilderness of Wyoming and a distant look-out tower where he plans to spend his summer. 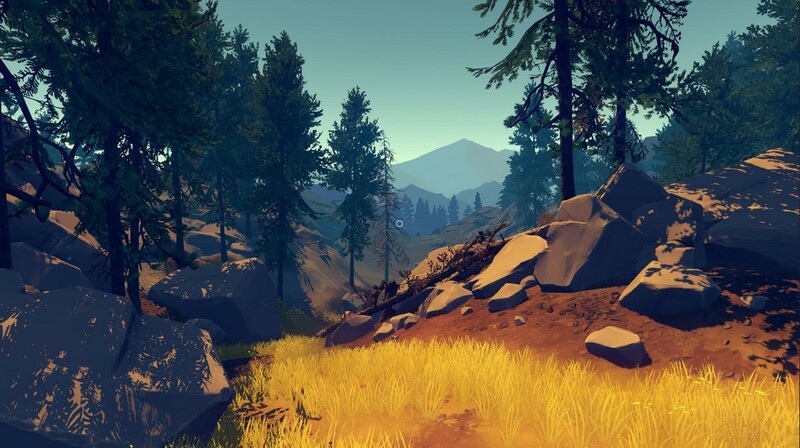 Immediately you can see that Firewatch is a very pretty game; a gorgeous cartoon style with rich colours. 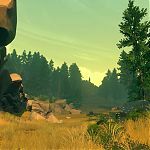 Very much like Borderlands with vibrant hues and an overwhelming landscape of trees, boulders and wildlife in the distance. 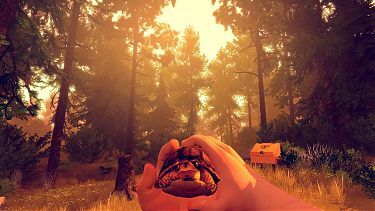 The opening scene is a slideshow of text telling the backstory behind why Henry would want to take a job with such isolation; broken up with gameplay while you make your way to your new home for the next few months. When you arrive at your basic but cozy cabin/tower the game really begins. Henry is greeted by the voice of Delilah at the other end of a little yellow walkie-talkie. Delilah is your boss in a distant tower, who gives you jobs to do while out in the wilds. 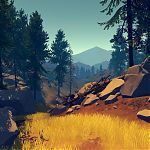 You chat away as you hike around the hinterlands; she responds to Henry’s questions, giving him advice on how to survive – not eating a years old candy bar is probably a good shout. The radio is a key piece of equipment in the game. 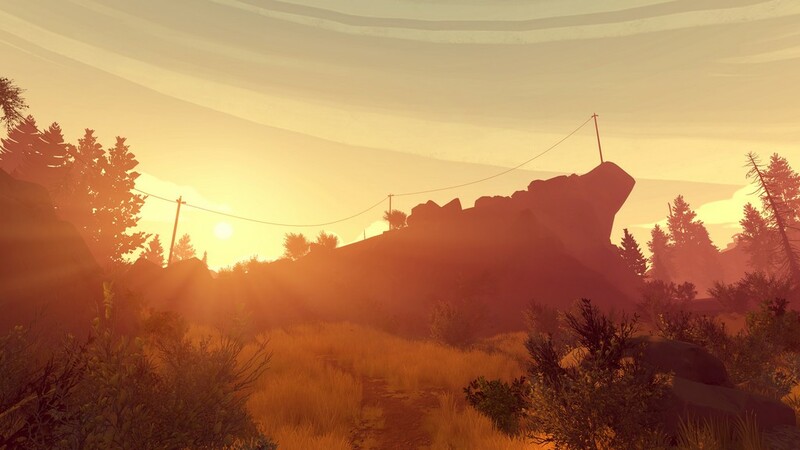 It’s Henry’s lifeline and a means by which you interact with the beautifully crafted world around you. Discarded litter, bear claw marks on trees, and illegal camp-fires can all be interacted with. You can pick up litter and examine it, or you can play the caretaker and throw it in the bin. By using your walkie talkie you can converse with Delilah while performing these activities. She’ll reply in kind giving you a few limited options to reply with. You can go straight to the point, give a bit of banter or sometimes even have a bit of a rant. 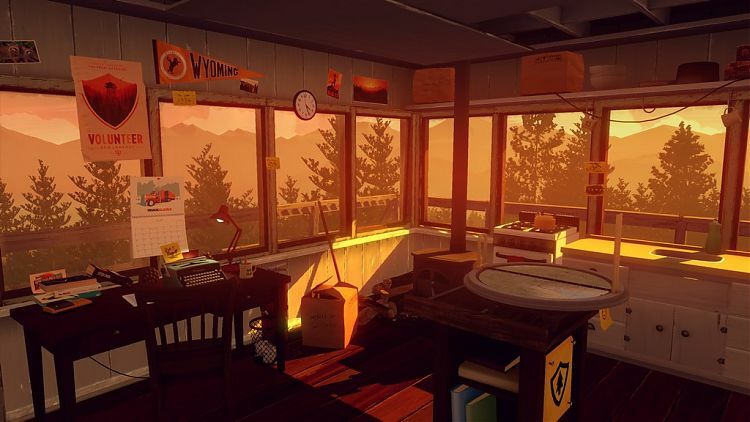 It’s the humanised dialogue that really makes Firewatch, and it draws you into the story. 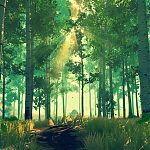 While chatting away with Delilah you navigate the forest using a map and compass, attempting to negotiate routes where at points you may need some specific gear to pass. 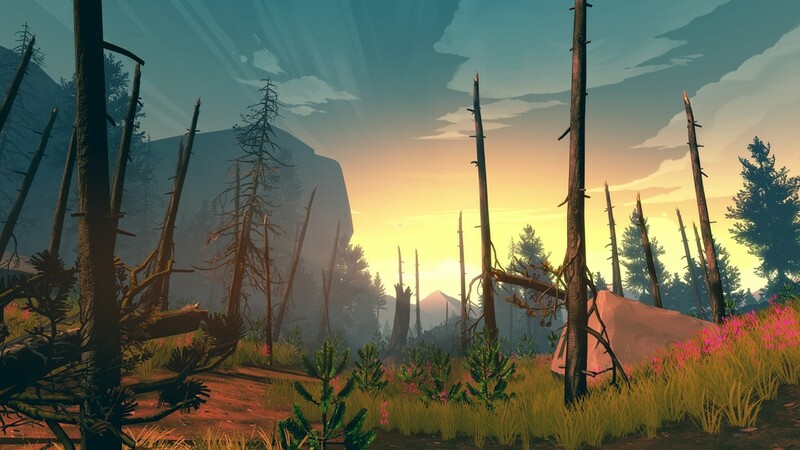 These may be points where you cannot climb until you have ropes and climbing equipment, or a way to pass some overgrowth that you cannot clear. 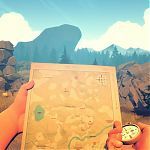 This feels natural, and in attempting to find another way around, you generally stumble on something of interest – allowing you to learn more from the story and at times open more dialogue between the two characters. The forest is pretty big, and being a forest there is quite a lot of walking. Henry is in his 40’s, so let’s be honest, you don’t expect the poor guy to sprint every where. A saving grace is that he can at least jog! I used this a lot to get from A to B. As mentioned, Henry is also in possession of a map and compass. 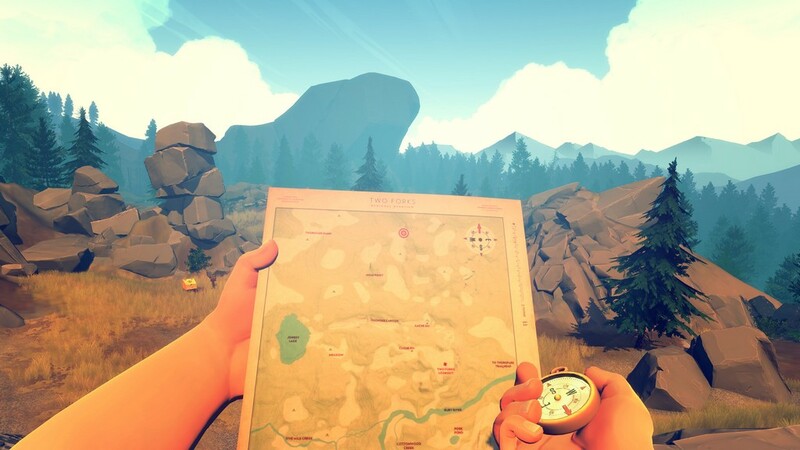 While trekking through the canopy of trees you can open the map up to get your bearings. To find where you need to go. 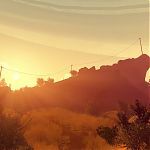 For the more adventurous player, it is possible to find some smart routes to cut through some terrain. This does allow you to move out and explore more while still keeping to the story. I only noticed a few places where I couldn’t go where I chose, but this was because of essential pieces of the story you can’t avoid. The story takes a few sharp turns from the midpoint. Earlier chats with Delilah talk of some mysterious research taking place on the park grounds, and becomes a full-blown conspiracy, when evidence threatens to implicate Henry and Delilah with some serious consequences. There is a good deal of genuine tension as the game jumps quickly through time to hit major plot points. Henry and Delilah’s initial friendship turns to distrust, just as a real life relationship under the strain of an intertwined conspiracy in the middle of nowhere. It’s clearly shown through their tendentious conversations via the two-way radio. Every development seems to point to more and more crazy plots, and to a game that’s about something much larger than a simple summer spent watching for fire hazards. 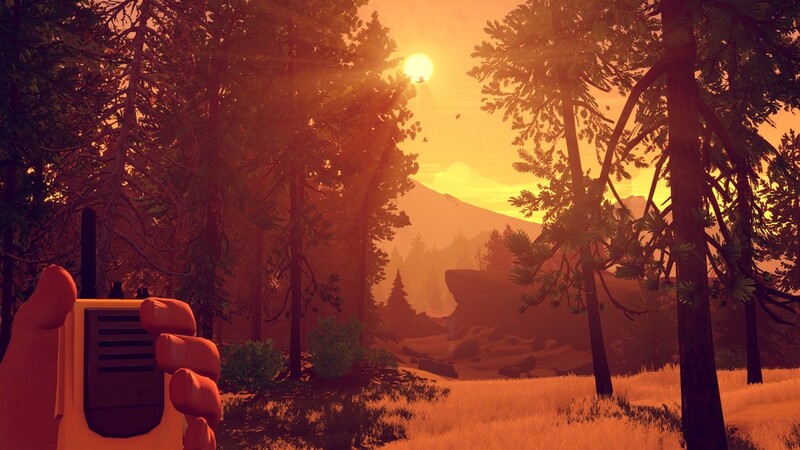 Firewatch does what it sets out to do. It tells a simple and effective story. But as captivating as the story may be, I can’t help but feel let down by it’s conclusion. 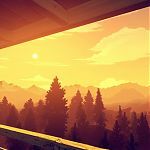 The beauty of your surroundings added to the vibrant colour palette and wonderful voice acting does help keep you wanting more – if you ignore the final few moments, Firewatch is a pretty amazing game. 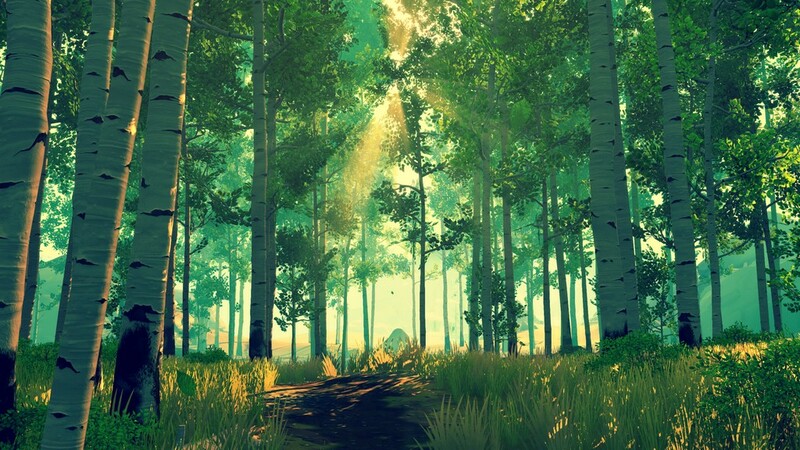 A beautifully crafted game with huminised characters. 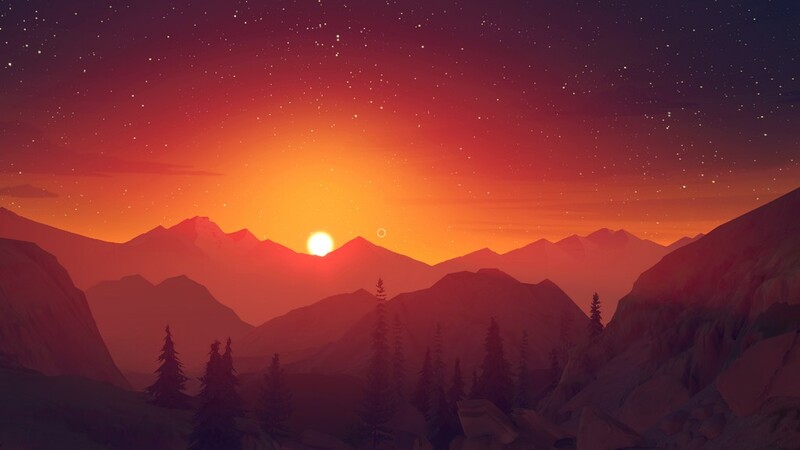 Firewatch is well worth the wait. 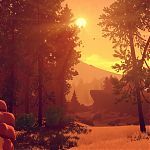 This review is based on playing the PlayStation 4 version of Firewatch that was kindly provided for review purposes by Campo Santo.